Having a place to restore your spirit can make a huge difference to your life. This could be a meditation space or simply a spot to enjoy a moments peace. As you know, I believe that there are many ways to calm the mind and restore the spirit and that this doesn’t necessarily involve sitting still and meditating. However, a designated space for rejuvenating the spirit can make a real difference to your life. A separate meditation space or sacred zone allows you to disconnect from the outside world and reconnect with your inner self. This can help you find inner peace, rethink priorities and gain focus to move your life forward in the direction you desire. Whether you choose to create a meditation space or just a simple corner to relax for a few moments each day, I am sure you will soon reap the benefits of having a sacred space in your home. What you do in your sacred space is a personal choice. I like to spend time in meditation, but I also like to journal, sketch, listen to music and read inspirational books and blogs. You could use your special place for hobbies, passion projects or just for a nap! The most wonderful thing about a sacred or meditation space is that it soon begins to trigger the mind into feeling calm as soon as you enter it. The space provides a cognitive cue that this is a time for relaxation and tranquillity. After using the space – for meditation, prayer, journaling or quiet contemplation – for just a few days, you will begin to feel soothed and yet exhilarated simply by entering the space. Over time this energy builds and your sacred space becomes more and more powerful. You don’t actually need a room of your own to create a sacred space. There are many ways to create an area for calm contemplation, meditation, or other self-care pursuits. 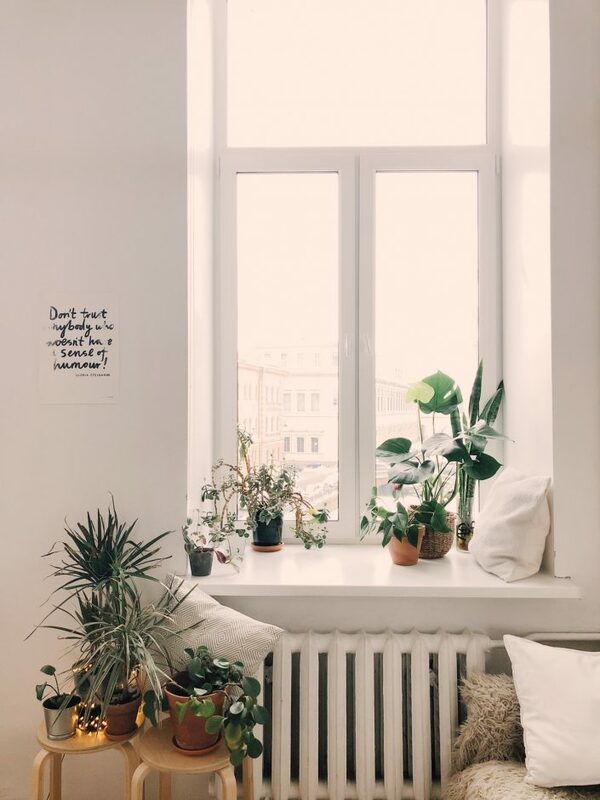 You could screen off a corner of the bedroom, create an altar on a shelf or windowsill, or just put a chair near the window to enjoy the view. You can create a sacred space in the garden or just choose an area in a local park to be your ‘spot’. So, here is how to create a meditation space or sacred area in your home that can support your emotional and spiritual wellbeing. If you are lucky enough to have a whole room you can use then this is wonderful. However, if you don’t have that luxury, try to find an area of your home where it is possible to get a few minutes of peace every day. If possible, screen this space off with a curtain or room divider. Often a corner of the bedroom works well. You can find some great ideas for room dividers on Pinterest. I love to use a Japanese style room divider as it still lets in all the natural light. If you enjoy long relaxing bubble baths then you could create a spa-like sacred space in your bathroom. If all else fails, perhaps you could convert a shed, garage, basement or attic into a sacred space. Of course, if you already have a chair in a favourite spot, you could add a few elements nearby to enhance this area. When creating a sacred space, you have the freedom to do whatever you want. This space is personal to you and you can decorate it any way you like. Personally, I like my space to be fairly simple, but not too minimalist. I like to have my favourite things around me and I like my space to feel cosy and warm. However, if you feel calm in an all-white room with just a pillow on the floor then go for it! A good place to start in arranging and decorating your space is to add items that stimulate the senses. Connecting with the senses can be a great way to slow down the busy mind and allow us to be more grounded in the body. This can help us give our mind’s a well-earned break. Of course, you can fill your sacred space with anything that delights you to look upon. Crystals, family photos, quotes or artworks all engage the sense of sight. However, having a focal point is useful if you want to focus and calm the mind. You could light a candle, or choose a piece of art or an image of a god or goddess to focus on. Some people love to light a Himalayan salt lamp in their sacred space as these increase negative ions in the air. This is believed to reduce stress and boost happiness as well as improving health. Incense has been used by many cultures since time immemorial to stimulate a heightened sense of awareness and help humans slip into a more sensually aware state of being. Scented candles also work really well. Try to go for natural soy or beeswax candles if you can. This way you aren’t releasing noxious fumes into your sacred space. 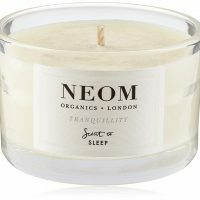 Neom candles are made from pure soy wax and scented with essential oils. I particularly love their Tranquillity candle – just a waft of it soothes me into a state of calm relaxation. I also like to have fresh flowers and flowering plants in my meditation room when I can. I like my meditation space to have a comfortable pillow and throw for starters. You can also use worry beads if you find them soothing. Another lovely way to ground yourself in your body is to give yourself a hand or foot massage, so keep some lovely scented hand cream nearby. To stimulate the sense of hearing you could play music, ring a bell or let a windchime tinkle in the breeze. 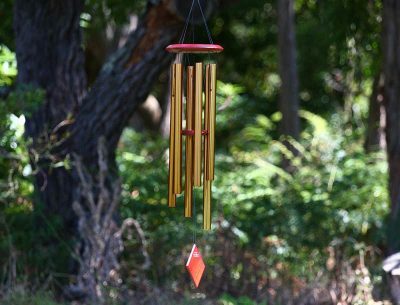 If you are choosing windchimes, make sure they are tuned, otherwise, you can end up with a clashing jangle rather than a melodic soothing sound. Woodstock windchimes are beautifully crafted from natural materials and tuned for a wonderful naturally soothing sound. Many people also like to have music playing in their sacred space. Again this is a matter of personal taste but generally, instrumental music is more soothing and less distracting than music with lyrics. I also like to listen to guided meditations from time to time and you can find lots of these on Youtube, iTunes and Audible. Before using your space it’s nice to give it a bit of a cleanse. This refreshes the energy of the room and clears any stale stagnant energy. But it also just feels nice to sit in a clean, fresh space. You can dust, vacuum or just open the window to let some fresh air in. You can also cleanse the space by ringing a bell, lighting incense or clapping your hands a few times. Of course, your sacred space won’t do you any good unless you use it regularly. Hopefully, your space is so beautiful and inspiring that you will want to spend time there. But of course, it isn’t always easy to find the time. We also often get a bit blocked about taking time out for ourselves. Try to commit to a few minutes twice a day to start with. First thing in the morning and before bed are great times. Choosing these times helps you to get clear and focused for the day ahead and then allows you to reflect on the day and calm the mind ready for sleep. Deciding what to do in your meditation space can be daunting at first. I suggest starting with a couple of very simple practices. I began by writing in my gratitude journal each morning, writing down three things I appreciate about my life. Next, I introduced a short meditation practice, just five minutes a day at first. It’s better to start a small habit and stick to it than to aim for a grand plan and struggle to attain it. You can build up gradually to create a practice that is perfect for you. If you don’t want to meditate, that’s fine of course. You can spend time in prayer, journaling, drawing, singing, contemplation, deep breathing or whatever practice suits you. Whenever you spend time in your meditation space, try to take a few deep breaths and connect to positive thoughts. You can also bring in any religious or spiritual practices that are meaningful for you such as prayer or visualization. If you believe in God or a Divine power then you can take a few moments to connect with this source. If you believe in a higher self or subconscious part of the mind you can tap into that instead. 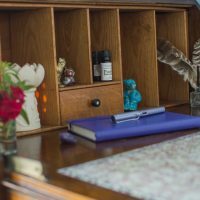 I hope this post has inspired you to create your own sacred space or meditation room. I’d love to know about your special places so please share in the comments below.